Dr D Digs Up Ancestors: Should I Take A DNA Test? I often am asked the question, Should I take a DNA test? This question is raised with more frequency when a DNA sale, such as the one I blogged about yesterday, is in progress. Up until the last few months my answer was, "Only if you have defined a genealogical question that a DNA test might help answer." who in your family should be tested to find the desired information. For genealogical purposes three tests are available to the general public. Y-chromosome tests, for men only, trace surname--paternal lines. Mitochondrial tests, for both genders, tract umbilical cords--maternal lines. Autosomal tests provide information about all ancestral lines but are genealogically useful for a few generations back in time. Therefore, the part of your family tree you are exploring will suggest which of these tests--if any are likely to provide useful genealogical information and whether you or one of your close relatives should be tested to discover potentially useful matches. 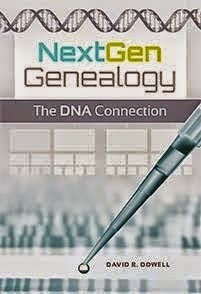 In recent months I have become aware of two other reasons for taking DNA tests for genealogical purposes. My father-in-law died in October. Subsequently, my wife and I moved into a continuing care retirement community. These two events have caused me to realize that the DNA of the older generation of our families is worthy of being preserved--along with their oral history and documents. Sometimes younger family members can be tested to achieve the same results. However, particularly with autosomal testing, every generational transfer erodes the results. A third reason for testing is curiosity about new things. This is not sufficient motivation for everyone. However, for those with discretionary income, it may be provide justification. DNA test results may provide entertainment longer than a golfing weekend and perhaps at a lower cost. However, if you are trying to justify testing on this basis alone, you should understand that you may not find immediate gratification through matches with previously unknown relatives. So, should you take advantage of DNA sales? Maybe. As long as you understand why you are testing and what the potential benefits may or may not be. The test results will not, by themselves, magically extend your family tree. However, when combined with traditional research methods and considerable communication with apparent matches, this tool can lead to new insights about your family history. The exciting possibilities of testing DNA for medical issues is an entirely different topic which I may blog about in the coming weeks. The potential of personalized genomic medical treatment are truly mind boggling as are the related ethical issues.